Now that we’ve talked a little bit about what kind of scale to use while charting and why is it awesome to keep a mood chart (if you haven’t checked those previous CHART WEEK entries out I might suggest you do so before continuing on) I wanted to give a few ideas on how to get more out of it. We’ve covered the basics, but as I mentioned in regard to when I started charting, I was taking information down on both mood and headache pain. Since then I have expanded my chart to include the tracking of a number of different factors. In my own chart I use a different colored pen on the same graph as my mood graph so I can see immediately how they are corresponding to each other. 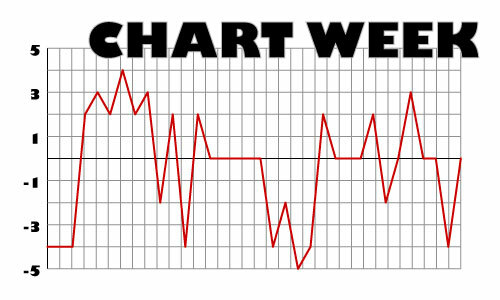 On a daily chart (that shows up as a monthly graph) you can do the same thing. You might want to consider tracking any of these additional things and more, if you think up any brilliant ones! Anxiety is one of the first things I added to my original graph. I only use the top portion of my graph to chart it, so I keep the 0-5 scale modified to fit the mild to severe moments of anxiety I experience. Sleep is a great thing to track because it has such a huge effect on our moods. Since I use an hourly chart with a daily graph, sleep is automatically included because I create a mark where I wake up and where I go to sleep. Since the graph covers 24 hours a day, I’ve also been using it to track how many times per night I have been waking up. On a daily chart/monthly graph you can start another line on graph in addition to the line you have going for mood, or a bar graph to contrast your mood line graph. The only trouble with having sleep on your monthly graph is that it is usually measured in hours, so the top value on your graph is no longer going to be 5, probably more like 13 or 14. Pain is a big trigger for me, so I track it several different ways. I have one color that represents headache-type pain, another for other sorts of “body-pain” (including the pain I feel when severely agitated), and a third color for pain associated with hormones, like menstrual cramps. Stress can be a killer, so it might be useful to track what sort of level of stress you are under, from day to day. Knowing how much stress you can realistically cope with and how much you usually crack under can mean possibly avoiding those stress burnouts. In addition to things like this that are tracked daily, it is also seriously helpful to keep notes of specific things. I write notes in the margins, under the timeline, and even on the graph at times. The more specific you can be, the better, but it helps to have a few set things to keep track of at first until tracking becomes almost second nature. These things could be the inclusion of specific types of symptoms, specific triggers you’ve noticed before, medications, and good habits like exercise. Psychosis/Delusions/Paranoia/Hallucinations are important to note for a number of reasons, as taking a note could potentially remind one to speak up about them to their doctor, for one. It also might be nice to know when these things are occurring in conjunction with your mood ratings, as things like psychotic depression are not unheard of and can be somewhat difficult to pinpoint. Mixed states can also be very hard to pinpoint, and I know that for myself at least I didn’t realize I was having them as often as I have been until looking at my charts recently. Denoting the combination of elevated and depressive symptoms somewhere on your chart could be very helpful in helping to see the “bigger picture”. Suicidal thoughts are another one that I make a reference to, and for my hourly graph I just write an “S” under the hour it occurs. This can help me discern just how bad an episode is, because I can quickly tell that a graph for a day that has 3 or 4 “S”s along the bottom is a lot worse than a day with just one. Outbursts are another one that I take note of and it helps me alot. Sometimes I will be having a mixed episode without realizing it, so if I’ve jotted down an “O” because I’ve snapped at someone earlier in the day, that is a pretty good indicator that I’ve been irritable without noticing. Of course, hopefully I will have noticed when I did it because I thought to myself oh no, now I need to mark an “O” on my chart, but nobody’s perfect. Really, any symptoms you want to keep track of at the same time -even for other disorders or physical problems, can be written down on your chart. And the more serious or bothersome the symptom, the better to include it in tracking. Yes ladies, that time of the month. It might be wise to make a little star symbol, or flower, or bar of chocolate, or whatever and be sure to jot down when it ends as well. If you’re a lucky person who runs like clockwork, this is probably a lot less of an issue, but for the rest of us this is never bad information to have on hand. Drug/alcohol consumption would also be a pretty smart thing to track, if you’re planning (or even if you’re not but happen) to partake. Working can be stressful on anyone, so you might want to denote what days on your monthly graph are spent at work, and which aren’t. On a daily graph, I usually mark down which hours I’m at work, because there are times when I can definitely see a big change happening due to the stress of working. Travel can be another stressful situation, so it doesn’t hurt to take a note any time you spend in long-distance transit or traveling long-distance. If you are someone who faces extreme anxiety when traveling shorter distances, it is definitely ok to note those times too. Personally, I would suggest taking notes on things that really stress you out or give you anxiety, so that if you are also charting the levels of either of those things you know where the big humps are coming from. Prescriptions are important to remember to take, so for me part of the ritual of taking them involves putting them in a log. Some of my medications (like for sleep) are as needed, so I want to track when I’m taking those medications to be able to really see what kind of effects they are having on me. Side effects can be written down in the notes near your charting and this can help gauge how long a side effect has lasted, or can held deduce what might be causing it. Over the counter medications are important to include as well. I am actually really thankful that I write down everything I take as I take it, because when I had the EMT’s in my apartment last November when I had that (almost literally) paralyzing panic attack, they had a very easy time seeing what kinds of medications I had taken, and even when I had specifically taken them. Vitamins and supplements are another thing to include, and charting can help us see if they are making a noticeable difference in our moods or general health. It is important to write down any medications, no matter how small, because part of the idea of the mood chart is to see what is affecting our moods. Many medications can effect them, even things like corticosteroids (which can be given for allergies or sinus infections) and everyone reacts differently. It is important to be familiar with how you react to the medications you take. Food can be an overwhelming topic to take notes on, but there are theories that suggest specific dietary changes can help alleviate mood symptoms. In this sort of situation (as well as for many others) I would suggest tracking what you’re eating. If you want to go so far as to write down exactly what you ate and what time, that is fine (and usually what is required for things like testing for particular food allergies) but even something as simple as listing how many servings of fiber you ate that day -really anything you want to monitor in hopes of improving your health. This can be great for setting a goal for yourself and tracking your progress because you’re holding yourself accountable every time you have to write down what you ate for the day. Exercise is in the same kind of realm for me, and I usually write down what kind of exercise as well as the duration. Yoga, 50 minutes. Running 30 minutes. It can be fun to see what kind of effects exercise have on our moods! I spent an hour on the treadmill while nearly manic last week and felt amazingly grounded for a few hours after. It blew my mind a little bit! Therapy can be good to denote on your chart as well, as it can have a definite impact on our moods both in a short term and long term way. So these are just a few examples, obviously there are an infinite number of things you can add to your chart and take notes on. The point is to consider what information will be useful to you, both immediately and when you consider what your symptoms are doing on a larger scale. This may seem like a lot of information, and I know I certainly don’t track all of these things, but as you work on your mood chart you’ll also find that you generally don’t have to track all of these things at once because they usually don’t all happen at the exact same time. And hey, there is nothing wrong with making it up as you go! The idea is to have a personalized system that will help with the management of your symptoms. Accessorize! This entry was posted in Bipolar, Newly Diagnosed and tagged anxiety, Bipolar, insomnia, mental health, mental illness, mixed state, mood chart, mood tracking, triggers. Bookmark the permalink. Food tracking is a great idea, but doing it right is exhausting! I had a friend who took photos of everything she ate rather than logging them. Hi there, just wanted to say YOU’VE BEEN TAGGED!!! !